“The Little Blue Dollhouse” series is based on the artist’s memories of her childhood home. POINT LOOKOUT, MO. 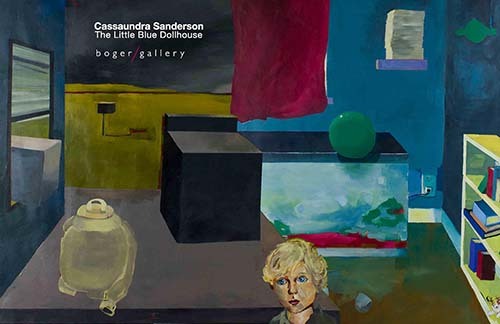 — College of the Ozarks will display the artistic work of C of O alumna Cassaundra Sanderson from Jan. 21 -Feb. 14, in the Boger Art Gallery. Located inside the Jones Learning Center, the Boger Art Gallery is open Monday - Friday, 8 a.m. to 5 p.m., and Sunday, 1 p.m. to 5 p.m. The exhibit displays paintings from the artist’s series titled “The Little Blue Dollhouse,” which includes canvas paintings and handmade scale models made from clay and Styrofoam. Sanderson grew up in Branson, Missouri, and graduated from College of the Ozarks with a Bachelor of Arts in fine arts, with an emphasis in painting and ceramics. She earned her Master of Fine Arts at the University of Arkansas School of Art in Fayetteville with her solo thesis exhibition, “For Wintonbury,” which included an accompanying collection of short stories. During her time as director of sUgAR Art Gallery, she curated the exhibition “In Which We Dwell (2016),” displaying the work of emerging artists Hilary Baker, Tyler Beard, Andrew Blanchard, Adam Ekberg, Matthew F. Fisher, and Ron Lambert. In 2017, she curated “Illogical Animus: A Survey of Artwork from Banned Countries,” consisting of six international artists and spanning video, ceramics, glass powder installation, and painting. Sanderson is currently a visiting instructor of drawing and painting at Windgate Center of Art + Design at the University of Arkansas, Little Rock. She is also a member of the reviewing committee for BFA applicants and the gallery committee for future exhibitions at Brad Cushman Gallery, The Small Gallery, and the Ann Maners and Alex Pappas Gallery.